You know Thanksgiving is just around the corner when you start seeing pies on display at the supermarket and start craving them when you go out to dinner. Below are some great versions you can try at home, Enjoy! This deep-dish pie has a nice balance of sweet and tart, with the Golden Delicious, Granny Smith or Honeycrisp apples and rich caramel sauce. Get the recipe here. 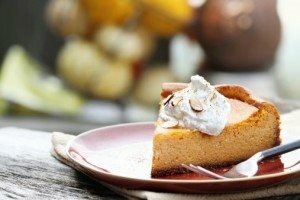 This inventive twist on the traditional pumpkin pie is likely to be a hit among your friends and family. It features a spiced filling made from whipped cream and a gingersnap crust. Delicious! You’ll find the recipehere. This combo of a cream and apple pie won a pie bake-off in Brooklyn, New York in 2009. And it’s no wonder—the recipe features apple cider, as well as heavy cream, cinnamon and sugar. What’s not to like? Get the recipe here. Pears are in season, so why not include them in a pie? This recipe features an amazing combination of thinly sliced pears, maple syrup and toasted pecans or almonds. You’ll find the recipe here.